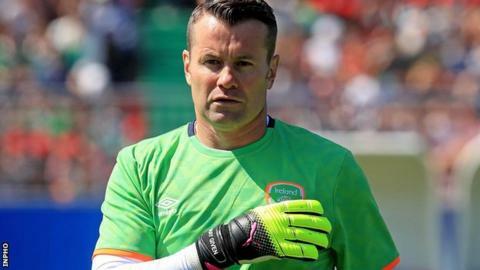 Former Republic of Ireland goalkeeper Shay Given has been released by Stoke City, after making just five Premier League appearances this season. The ex-Newcastle, Manchester City and Aston Villa player joined Stoke in 2015 but has not played since September. Given, 41, is one of six players to be released but Irish midfielder Stephen Ireland has been offered a new deal as he recovers from a double leg break. Phil Bardsley and Geoff Cameron, both 31, have signed new deals. Right-back Bardsley has agreed a 12-month extension, while United States defender Cameron has signed a new two-year contract. Given played 11 times for the Potters during his two-year spell, six of which came at the start of last season when he deputised for injured England keeper Jack Butland. Professional contracts have been offered to three members of the club's Under-18 squad, including two-time Player of the Year, Thomas Edwards.